OPENING THE DOOR ON A GROWING OPERATION. Sarah Lambert Freeman opened Hive & Hollow in Menomonie this past September. 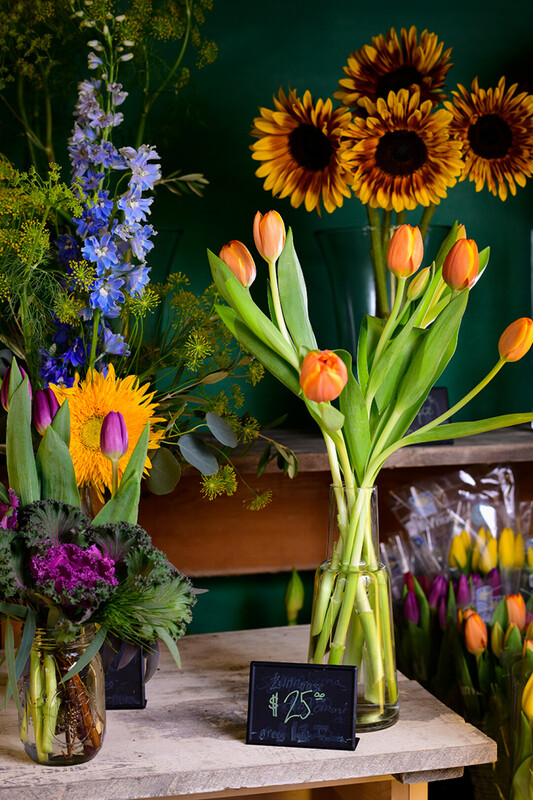 An eclectic flower, plant, and decor shop, Hive & Hollow focuses on sustainable practices. 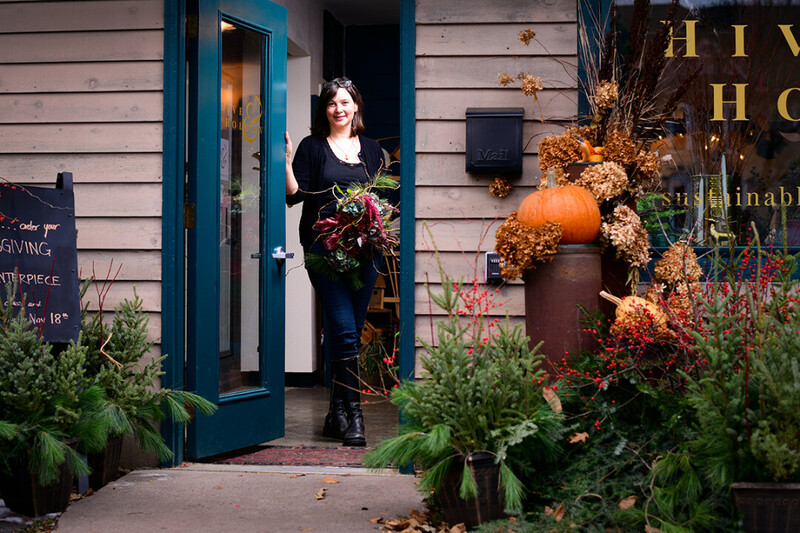 September, as autumn settles into Menomonie, might seem like an odd time to open a shop that deals in flowers, but in the case of Sarah Lambert Freeman’s Hive & Hollow, it’s the perfect chance to show locals what makes her floral services unique in the Valley. “What I’m trying to do that’s different is having all of my flowers sourced as locally as possible,” Sarah said. In the spring and summer that means using supplies from her own greenhouse and garden and supporting local flower growers. When the winter months restrict local options to willow branches, pine cones, and evergreens, rather than ordering carnations and roses from Central American farms, she brings out the best of the seasonal options, accentuating them with plants from a Minnesota greenhouse. Sarah is also celebrating sustainability through her choices in product. She recalls a conversation with a fellow florist from ten years ago, when her coworker expressed concern the effect of floral industry chemicals on fertility. Before then, she hadn’t realized the proliferation of carcinogenic chemicals in pesticides and plastics associated with flower arranging. Sarah aims to carry as many organic, recycled, and locally grown products as possible to avoid negative environmental impact. Many of Sarah’s arrangements are presented in thrifted tins, glassware, and pots. On a recent Friday, she placed a bridal bouquet in a mason jar of water to preserve it until pick-up. She wraps bouquets in paper and keeps corsages in recycled plastic take-out containers, opting for recycled boxes over new when she can to prevent waste. “We have alternatives (to waste and pesticides), so I feel like it’s my calling to use them,” Sarah said. Sarah’s arrangements are eclectic and adventurous, sometimes sporting dinosaur figurines and locally foraged mushrooms among dill and other unexpected plants. “My woods have given me an endless source of inspiration,” she said – she often includes found items such as bird feathers in her work. Among the arrangements in the shop are products by other local artists and makers, including soaps by EB Ranch, felted animals by Mary Marin, even stones and crystals collected by a local 13-year-old. Sarah has more than 25 years of experience in the floral industry, getting her start in the Twin Cities where it’s often viewed as a true art. She’s proud to bring her interpretation of that art, with all of its eccentricities and focus on promoting local products. “It seems like everything I love to do is crammed into this little 500 square foot space,” she said. Hive & Hollow offers bridal, funeral, holiday, gift, and every day arrangements in addition to seasonal centerpieces, flower subscriptions, and arranging workshops. The shop is located at 809 Wilson Ave. in Menomonie. Hours of operation are Tuesday, Thursday, and Friday from 10am-6pm, Wednesday noon-6pm, and Saturday 9am-2pm. For more information, visit www.hiveandhollow.earth.